The clerks at the Grand Exchange have decided it is about time they upped the quality of their service. As such, members now have access to 8 Grand Exchange slots and free-to-play players have access to 3 Grand Exchange slots. Dueling in the rat pits has been re-enabled. On a serious note: I feel we REALLY need to remove PVP Worlds, they are lacking the wilderness PKers so much. I go into the wilderness everyday (Multi especially) and it's dead. If we were to poll to remove PVP Worlds this would make the community and CLANNING 110% better! Please poll this! Why did this have to be done at the same time as RS3's update to add GE slots? I thought both game engines were separate. EDIT: Is that Reach's buy/sell offer in the picture? 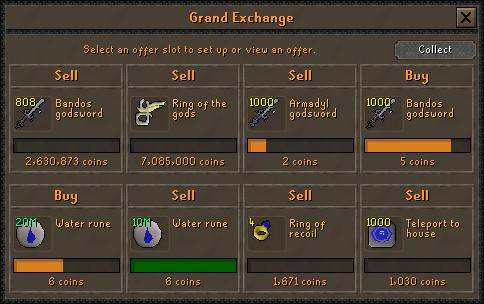 I'd like to sell 1k AGS's too!